It's not often we all get together on the same beach on the same night, but on this night it's the entire Ninja Squad on the Beach. Whenever we all get together one thing is for certain, we are going to have a great time. On this night, everyone has one rod for deployment. We get to the beach just before sunset, and we start rigging up and get ready to take baits out. We deploy 4 big baits at different distances and it’s a good variety of baits. The night is slow but we have some good conversations and catch up on a few things. Before long we are all tired and we all head to our sleeping bags and blankets. 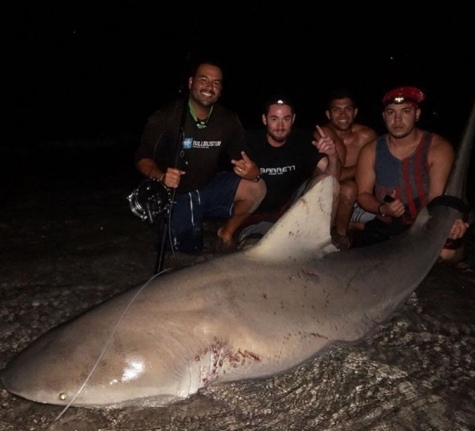 Around 2AM Luis gets a solid hit on his 14/0 packed with 300LB Bullbuster. This Shark doesn't hesitate and it takes the bait. Luis feeds the Shark and then decides it's time to set up. Luis is on and this is a Nice Shark. This Shark doesn't give an inch and it's a tough battle but Luis has this Shark under control. We think it can be anything at this point. After a good battle the Shark is finally close to shore and it's a Really Big Bull Shark. She's full of fresh mating scars. This Bull Shark is near 9ft long with a Big Girth. We quickly take a few pics and release this Big Bull Shark. After the release its starts pouring cold rain and we decide it's warmer in the beach water lol. So we take a dip. The remaining time is quiet so we pack it up and call it a night. Great night spent on the sand with the entire squad. 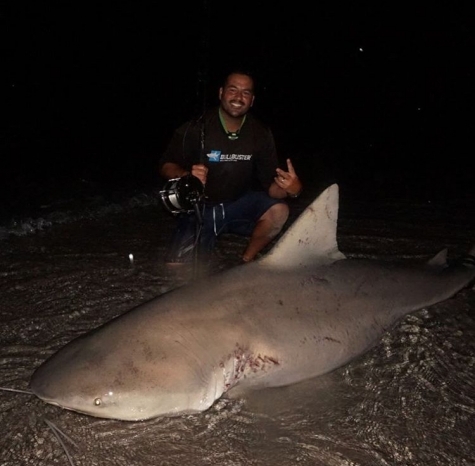 This Bull Shark is near 9ft long with a Big Girth. We quickly take a few pics and release this Big Bull Shark. After the release its starts pouring cold rain and we decide it's warmer in the beach water lol. So we take a dip. The remaining time is quiet so we pack it up and call it a night. Great night spent on the sand with the entire squad. Hope you all enjoy the report. You can follow us on instagram @ninja_sharkers as we are very active on there. Make sure you enter our promo Code Ninja on any Bullbuster order so you can 10% off your entire order.